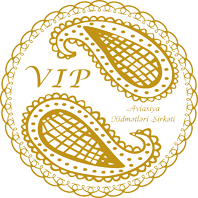 Beginning from December 25, 2011 "VIP Aviation Services Company" LLC provides commercial and ground handling services in the International Airports of the Republic of Azerbaijan on the basis of the Certificate of conformity issued by State Civil Aviation Administration and in accordance with the "Airport Handling Manual" and "Standard Ground Handling Agreement - AHM 810" of the International Air Transport Association (IATA). The external ISO 9001:2015 re-certification + upgrade and OHSAS 18001:2007 re-certification audits was carried out in our Company. 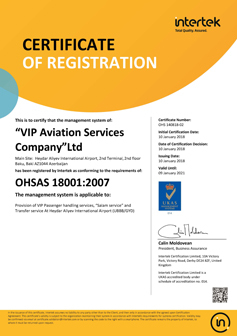 An independent certification body - Intertek confirmed that VIP Aviation Services Company meets all Integrated Management System requirements. Since the establishment of "VIP Aviation Services Company" LLC, it is a member of the Ground Handling Council of IATA (IATA GHC) and World Airports VIP Forum (WAVF).